Annette W Lindores Construction I liked the amount covered, the speed and the flexibility in catering to different needs. Very good! Alex GC Council Very well explained. Annette was fantastic! I’m leaving with much more confidence. It has all been really good. Super friendly staff, great presenter and great course info. Louise Work Cover Excellent! A helpful, amazing company. There is nothing to be done to improve the course. Wonderful! 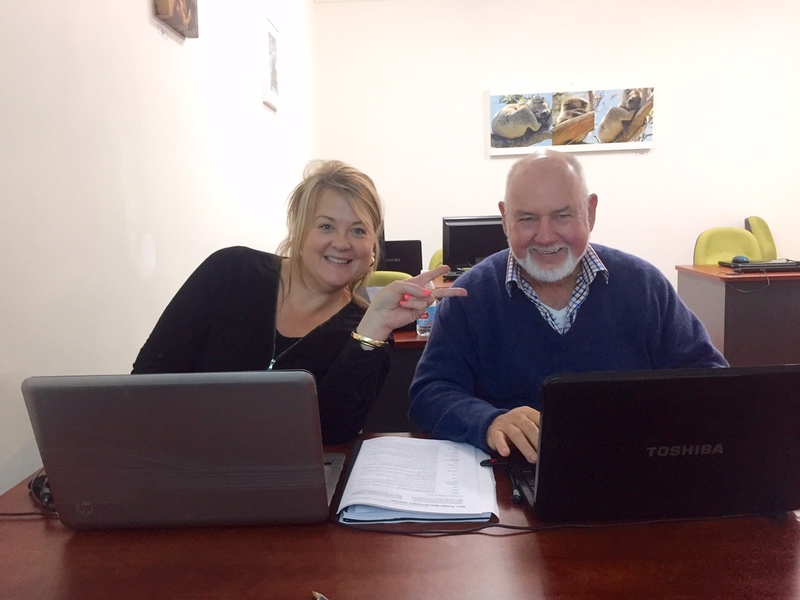 Alex GC Council Mark’s personality was refreshing when training on a sometimes difficult, boring subject like Excel. It was very clear, well- explained training. Mark’s Dad jokes are great! 😀 Thanks Mark. Lana Spell & the Gypsy Collective Mark was very helpful. It was great! We will be back. Andreia Emerald Lakes Management Mark was very helpful and patient. It’s all excellent! Very professional. Shaun DVA Excellent! It was a good day. 😆 Thanks Mark. Isla Very informative. Easy to take in the information and “brush up”. I enjoyed taking this course. Josh Dept of Human Services Excellent! The tailored course and content was relevant to our needs. Kirsten Dept of Human Services Fantastic! Tank you. I have learnt so much and am looking forward to applying this knowledge in the workplace. Vicki GC Council Very relevant and logical delivery of course material. Excellent! Christopher GC Council I liked the pace of the presentation and the work through of the examples. Sharon GC Council Trainer was excellent. Good examples and plenty of opportunity to practice learning. Julie. GC Council Gordana ensured everyone kept up with this fast-paced training and gave individual attention to all. Adam GC Council I really enjoyed the opportunity to learn the skill and then apply to the program. It was great to do the refresher first thing on the second day. Great facilitator with lots of opportunities to ask questions and practice. Melissa GC Council Excellent facilitator. Gordana’s knowledge and training methods worked well for the group. Jade GC Council Gordana was a great trainer and is so knowledgeable. The course was fantastic and suited my needs. I am keen to come back and learn some more. Harleen. Gold Coast Council. The content was great and I loved how it was delivered. It was great! Craig. Gold Coast Council. It was specific and customised to forms and documents that we use on a daily basis. A very informative and productive day. Kym. Gold Coast Council. Gordana kept it simple and to the point. Fantastic. I loved that it was customised to our needs. Very relaxing and enjoyable. Melonie. Dexus Property Management It was very easy to follow and fun. An awesome experience. It was recommended to me and I will absolutely recommend to others. See you next month for Level 2. Ivan. Benzini Pre-cast. The course was informative and very easy to understand. I have more knowledge and workability with Excel. Brittney. Classic Holidays. Time went really fast and Mark was great, making it enjoyable. It was awesome and I would recommend training with Mark. Derek. LC Logistics. I most liked that it was One on One training. There is nothing you can do to improve the course. EXCELLENT. Cassandra. I loved everything about this course. I am happy that they are able to show me the ropes. Rebecca. Brown Bros. It was very informative and I learnt so much more than I expected. I thought I knew a fair bit about Excel already but realised today that I knew very little. Absolutely loved it and would recommend to others. Jade. Qld Health Loved the relaxed environment. Very friendly and easy to follow. A comfortable environment to learn in. Bev. Qld Health Plenty of opportunities to put learnings into practice. Excellent! Thanks for making it fun and interactive. Emily It is very detailed with clear instruction and advice. I was very impressed and will utilise all that I have been taught. Helen I enjoyed being able to customise to what we do. Don’t change anything – it’s working! Enjoyable. Vicki It was very informative and exactly what I was after. Mark is very friendly and helpful. Kerry GCCC Great venue and loved the friendliness of the staff. A very enjoyable training session. Tanya Gold Coast City Council It is so relevant to what I do. Face to face training is an easier way to learn for me. The trainer was amazing – easy to understand and very knowledgeable. Muhunthan GCCC I liked vlookups, index and macros. It was very good. Michele GCCC The course flowed. It was valuable and pertinent. The Best ever course! All the facilities, seating plan, room temperature. Definitely got great value which I will put to good use. I am looking forward to Level 3. Sam GCCC So much content, but wonderful to learn new things and cement existing knowledge. Gordana has amazing knowledge and was readily available to answer questions. I most liked absolute cell references, sort and filter and conditional formatting. The course was excellent and I would highly recommend it. Fab KDR I am very satisfied and I have already recommended this course with this provider to a colleague. The list of keyboard shortcuts was great. Ellie Pure Water Systems It was really clear and easy to understand. Great explanations. Great! Gordana was excellent! Melissa Pure Water Systems Gordana is a clear and supportive trainer. She was fantastic/clear/concise/helpful and clarified any content. Niamh. Really impressed with the delivery and quality of the course. Mark was very patient and made it a fun and interesting learning experience. Excellent teaching practices and he has very good people skills. I left feeling that I had gained so much knowledge. Excellent – I will be back! Darren. The formatting was the best thing that I learned. It was informative and enjoyable. Katie. Qld Health.Loved everything. Fantastic! Katie. Qld Health. It was easy to keep up. Fantastic! Darren. Council of GCC. The training was very professional. A very good trainer. Karina. Tweed Health for Everyone. Awesome! Everything was explained thoroughly and I was very pleased with the course. Awesome! Corey. Superior Group. Very informative and my skills are easily improved. It was a good pace and I didn’t feel rushed. Amanda. Council of GCC. Gordana was wonderful. Such a lovely lady! Thank you. Loved the short cuts and solutions to everyday tasks. Great! Renee. Council of GCC. Trainer explained everything so clearly and we practised regularly. Great training and so worthwhile. I would recommend this course. Emma. Villa World Developments. The course was personalised and tailored to what I needed to do. The trainer has excellent knowledge of the software. It was GREAT! Thank you! It is really great that I can apply all of this to what I am doing in my workplace. Dan. Villa World Developments. Very happy with today! I loved how everything was made relevant to us. Ryan. Villa World Developments. I really loved the practical application to business procedures. Excellent. I will be back. MS Excel Level 3 Advanced. April. Qld Health. Excellent. Keep the course as is. Thank you. Izaac. Superior Group. Very thorough. Relevant topics. Enjoyed it and learnt a lot. David. SPA. Learnt lots of shortcuts and better ways to use Project. Don’t change anything. It is Very Good. Kathleen. Surfside Buses. Good structure. Able to ask for additional topics to suit. I really enjoyed my three courses here and I hope that I get the opportunity to do more levels. Eddie. Work Cover Qld. Very happy withe course. Loved the way everything is explained so clearly. Michelle. Superior Group. What did you like most about the course? All of it! I learnt heaps. Excellent. Alicia. Qld Govt. Fantastic! The flexibility in targeting content to questions in addition to covering the course outline was great. Kym. Shred-X. Gordana asked us what we needed from the course and changed it around for us. MS Excel Level 3 Advanced. Gordana. Faizah. Qld Health. I love the team at Computer Smart. they are so friendly and helpful. Gordana is a fantastic trainer. Janine. OntheNet.Great! Very knowledgeable and friendly tea. I was able to ask questions and get answers specific to our work. Kai. OntheNet. A really good overview of the higher level Excel functions. The small class and the tailored content were the best things. Kristen. Gold Coast City Council. It is a really interesting and productive course. The variety of topics is excellent. Kelly. Gold Coast City Council. A great group; great trainer and plenty of laughs. This is the second session that I have attended and I really enjoy the small group training in a comfortable environment. Akua. It was Excellent. The course is very detailed and no improvements are necessary. Having one on one with my trainer gave me a lot of confidence and I can use computers easily now. Sharlene. Epic Assist. Excellent practical training. Really enjoyable. Lots of learning tips and information about Excel and PowerPoint. The trainer knowledge is excellent! I need more time and another session. Caroline. Griffith Uni. Excellent course. I especially liked the clarity of the explanations. It was GREAT and Gordana is a great trainer. Fran. Griffith Uni. It was really engaging. Excellent. Kat. Council of the City of Gold Coast. It was really beneficial. Great! Thanks again. Paul. Excellent for everything. The best parts were the friendly staff and the ease of the learning. I was made to feel at ease and this made the learning easy. Send me for more training! “Livo”. Awesome course. It was interesting and informative. Makes me want to further my computer knowledge. Excellent for everything. Blue Care. This has been one of the most successful training sessions provided to the group. I’ve never heard such ‘buzz’ when discussing the training on more than one occasion. Everyone talking together about how good it was. MS Excel Level 2. Gordana. Sam T. ALDI. I have a much better general understanding of formatting and an increased ability to handle larger amounts of data. Excellent! James. ALDI. Excellent. I liked the fact that everyone gains an understanding before moving on. Michelle. ALDI. I really liked the variety of the training and being able to ask a lot of questions. Marc. Patterson Glass. GREAT- will be back! Graeme. Self employed. Simple English. Balanced and Clear. Shane P. A Great experience and a happy environment. Clinton. Sirromet Wines. Covered everything I needed covering in my new job. Will consider trying the next level. Very good. Will recommend to others. Brooke. I really liked being more comfortable with Excel now. Excellent! Betty. Norco. ENJOYABLE! Excellent interactive training. Jordanna. Norco. It was directly related to work. Excellent. Julia. Council of City of Gold Coast. GREAT! Darren. Fulton Hogan. Excellent! Great delivery! Clear and easy to understand. Very comfortable. Angela. Gold Coast Water. Thank you. I thought that the pace was really good. I most liked learning about styles. Helen. Gold Coast Water. Excellent! I really liked learning new tip bits for everyday use. Natalie. Excellent. Well-paced and informative. Charlotte. The Starlight Foundation. The content was easy to understand and very helpful. It was really positive and I feel like an Excel Wizard now. Colin. Linemarkers SEQ. Friendly and easy to follow. It was fun and enjoyable. Excellent. Sue. Easy to understand and Excellent. Karl. It was a good pace and no-one got left behind. Very happy. Sue. Excellent! Very easy to understand. You cannot improve this course. Ann J. Excellent presentation and friendly. Fantastic! Ben. ALDI. Very useful; very user friendly; very practical. Excellent training – kept my interest the whole time. Shay. ALDI. The practical, hands-on training and Gordana’ s ability to explain things easily. Iesha. City Of Gold Coast Council. Excellent. She explained in detail the importance of relationships. She was happy to discuss the constraints on examples. Chris. City Of Gold Coast Council. Excellent. Power Maps was PERFECT for my work. Holly. Somerset College Excellent. It was personalised to my requirements. A Great facility. Gordana had lots of knowledge. Adrianna. City Of Gold Coast Council Clear explanation of functions, commands, formula etc. Excellent! looking forward to Levels 2 and 3. Debbie. City Of Gold Coast Council Excellent. I have found a much easier way to create flowcharts, work flows and organisational charts (as opposed to MS Word). Great training. We were able to customise the training to our needs. Krysten. City Of Gold Coast Council. Excellent. The best thing was being able to practise in the actual software. I enjoyed putting together a workflow chart. Great examples and practical time. Atish. Lumascape It was Excellent and I most liked the way the trainer enabled us to manage our own tasks and projects. The trainer was great; very helpful and most resourceful. Stephen. Lumascape. We focussed on our specific needs. Everything was explained with examples. Davor. Lumascape. The quality of the explanations and the hands on help was what I liked best. Johannes. Lumascape. Excellent. Resource Management was the best part. Ann J Excellent. I learnt lots of new things. I liked everything! Kaye is very knowledgeable and the training was really well – executed. Sharon B Excellent. Gained the knowledge I needed to get started using Reckon. Karina Von Bibra Excellent. Really helpful trainer who explained everything in full detail. She was fantastic. Carmel Von Bibra Gordana was very patient and tolerant. Just lovely 🙂 Everything was explained very simply. I thoroughly enjoyed it. Anita Von Bibra I enjoyed learning all of the aspects of Excel and I learnt a lot. Trish Von Bibra Gordana spoke in easy terms; was easy to follow; allowed questions and all was explained really well. It was all good and I felt very comfortable. Tania Von Bibra What did I like most about the course – All of it! It was EXCELLENT. Karyn – Marland A great experience, very informative. Mark was a fabulous trainer. Jennifer – Marland Very informative and the trainer made it specific to our work site. The knowledge was really useful to us. David – Marland It was very structured and a great experience. Ron Sebenico It was just Excellent from start to finish. It could not be better. Jackie It was very hands on and I really like Mark’s jokes. Very good course; friendly training; not as stressful at all like I thought that it would be. Holly I will be back to do future courses. Mark was very easy to learn from. I could not fault anything. It was great, fun environment and I felt that I learnt a lot. Peter CGCC I enjoyed learning about the computer and how to use it. Everything was what I wanted. I now have a lot more knowledge of computers and learnt programs that I wouldn’t have. Tracey Mudgeeraba Special School Fantastic. Practical and well paced. Daniel Currumbin Community Special School Very practical Great practical information. Annett Ed Qld Excellent. Great hands on help; clear info and guidance. Karyn Ed Qld I really like the trainer’s knowledge of Excel and her ability at all levels of experience and expertise. She was excellent! Thank you. Tamra Edens Landing SS Excellent content and pace. T was extremely happy with the course!! Kara DET It was hands on and easy to apply to current environment. Gordana was fantastic. She tailored the day to our needs. She was easy to understand and patient. Rachel Edens Landing SS I learnt so much that i can now apply to my position. It was excellent and very worthwhile. Gail Brisbane School of Distance Ed I really liked finally understanding formula. It was very good, although it would be good to have two days in a row. Ben Council of GCCC I enjoyed learning about macros, pivot table and V Lookup. Awesome! Wouldn’t change a thing. I always learn heaps! Vicky Ed Qld The day went quickly because it was fast paced and interesting. I liked the way that they rang the day before and went over the day- where to park; what the day looked like. It was Impressive. Practical. Supportive. Kelly Bradnams It was easy to follow with lots of help when you need it. I learnt a lot. Sandy Bradnams It was good to follow and very helpful. I was very pleased at the end of the day. Regina Hunter Industrials I really like the flow and explanation of things. It was a knowledgeable and informative day. Samantha Bradnams It was great refresh for me. Excellent! Robyn Bradnams Very informative and Very enjoyable also. Matthew The course was tailored to the students’ needs. I enjoyed the day and I now feel more confident in using the software. Kerri It was a well structured and presented course. Very informative and hands on. Tim It was specific to the attendees’ requirements. Hands on with very good examples and exercises. Very positive! Dan A small group with good presentation aids. Very worthwhile. Phil It really helped in my position with flow charts; workplace health and safety applications and field layouts. Amy I liked working at my pace in a One on One situation. It was Excellent and well worth the investment. Jackie Villa World It was presented in an easy-going, relaxed manner for great learning. A great course with backup provided if needed. Tony Gold Coast City Council. What I liked most about the course was being able to use a computer without being frustrated. It was very good and most helpful. Dion. It was a small class and that is what I liked most. Everything was Excellent! Relaxed experience. Tegan – Gold Coast City Council. I most liked the set up for the day and the knowledge of what we were to cover. Pam had great knowledge. Fantastic! I have (and will continue) to recommend Computer Smart to anyone looking for training. Andrew – ABC Bricks Excellent! Liam – ABC Bricks. Comprehensive coverage. Very good. Renee – ABC Bricks. Very informative. Brilliant and very easy to follow. Camilla – Dept of Communities. All the questions were answered respectfully. The part I liked most about the course was all the working examples and shortcuts. It was a positive experience and I am excited about improving the efficient use of Excel. Maree – Dept of Communities. Excellent! It was very good and I learnt so much. Ros – Dept of Communities. It was very good. Thank you. I will do Level 3 next. Paul – Disability Services. Gordana kept the training moving along all day. Great! Lyn – Dept of Communities. Learned lots of new information and shortcuts from the first 5 minutes to the end. Loved the training. Kathy – Dept of Communities. Practical. Hands on. Good guidance and opportunities to practise. Excellent course. Kerry – Dept of Communities. Trainer explained things well. Very useful and informative. Lisa – Dept of Communities. Learning absolute references plus shortcuts. Jodie – Dept of Communities. The best part of the course was – All of it! Shortcuts, formula. Fantastic! Hilary Excellent! Very good, especially the smaller number of participants. Taryn Qld Quality Constructions. Really great course. The knowledge I gained was excellent. The manual was easily understoon. Jude Bad Monkey Great communication and encouragement from the trainer, Tanja. She gave us a very organised materials’ folder. It was Wonderful! Loved it. Excellent for everything. Lee Gold Coast Water Mark’s knowledge and ability to explain subject matter made the course very enjoyable. One of the best courses that I have attended at Gold Coast water. Joanne Queensland Health There was a small class and it was paced well. It was Excellent and I learnt lots. I wasn’t bored at all. Edwin Council of Gold Coast City The trainer (Gordana) was very patient. It was really good info and it will surely be helpful for my work. Excellent. Ros The interaction with the trainer (Gordana) was my highlight. It was an enjoyable course and most informative. Jody There was a small class and all the questions were answered really well. It was very easy to learn and I could keep up comfortably. Denise The course suited what was required of us to learn. It was Excellent and I learned a lot to take with me. Keryn I learnt new ways of doing things and I enjoyed the small number of people. Kristie-Rae It was HandsOn which helps us to remember. I was very happy with the training. I enjoyed learning all of the extra things that i did not know existed in Outlook. Excellent. Carol I really enjoyed learning new tricks and refreshing previous knowledge. It was most enjoyable. Trina Computer Smart were fantastic in getting this course together so quickly. Highly professional and proactive. Sylvia This course was customised to our needs. Our expectations were met. We will be back!! Helen I really liked the flow of the course and the trainer, Steven Knight, was very willing to tailor the content to suit our needs. Margo The pace of the training was excellent. Very good! Julianne I especially liked gaining an understanding of how SharePoint can be used in our work environment and the practical session time. The training was beneficial and enjoyable. Katie I really enjoyed this training course and the fact that we were able to be so practical and hand-on. Great group of people. Trainer, Steven Knight, had an immense amount of patience and knowledge. I really enjoyed it. The trainer reviewed the demonstrations and examples, going back over it to make sure that we had a good understanding. I really enjoyed everything about the course. Excellent for everything! I liked learning the alternate ways to access different areas. It was really good to expand my limited existing knowledge. Wonderful course and I thoroughly enjoyed the day. The course content, structure and length was excellent. The trainer’s knowledge and the feedback provided during the course was also excellent. Well done! It was a most enjoyable day. Very informative. I really liked figuring out how Animations work. The course was educational and enjoyable. Mark is an excellent teacher, with his many years of experience. It was excellent tuition. We covered a lot of places on the computer and I can now find my way round it. I’m no longer scared of it. Mark was a great help and was very easy to understand. I really like the small class and interactive nature of the course, along with the opportunity to apply the skills to my own project. The course was great – concise, but covering all the important details. The trainer, Madeleine , was excellent – with a flexible training mode and timing. What I really liked about this course was learning at your own pace. The overall experience was great. The course was done in depth and the trainer (Gordana) was always there to help. I learnt heaps of things that I didn’t know. The teacher (Mark) was great. It was an unbelievable training experience. I most liked the ability to learn exactly what you need and the flexibility of content delivery. It was great, as was my previous experience at Computer Smart. I will be back and I will recommend it. A fair pace and crystal clear instructions. The treats at Morning and Afternoon Teas were much valued and appreciated. The things I likes most about the course were that it was set out in an interesting way; the layout of the manual and Sue’ s (the trainer) industry experience. It was relaxed and professional with excellent facilities. I was the given the actual necessities/ fundamentals to get a job. It was excellent. I was very apprehensive about attending such a course at my age. After all that worry, it was truly great. Practical, useful knowledge. This was a great course gaining tips, tricks and knowledge that I know I will use in the future. P.S. Carl has since completed Levels 2 and 3 of Excel. Brilliant! I feel very empowered now. There were so many topics covered. Mark was very patient- an excellent trainer. He made me feel at ease and created a really good learning environment.The facilities are excellent too. I am feeling much more confident with computers now and I have improved my computer skills so much in such a short space of time. Adobe In Design. It is such a creative program and so much fun to learn and use it. Gordana said that I could call anytime if I had forgotten anything or need help (she may regret that). One-on-One was great as the session could go at my speed. Thanks. Adobe Photoshop. I liked learning everything about Photoshop from the beginning – how to cut images and create collages; and the theory behind colours and images. It was really very good! The venue and staff was one of the best I’ve been to and I do do a lot of traveling. Facilities were great and staff keen to assist. No issues at all over the two days. Thanks very much I hope to be back. I would just like to thank you for all your help over the last couple of weeks. I really don’t know what I would have done without you, you have always come up with an answer to all my computer problems not only training, even when I needed a bookkeeper you were there to help me out and someone to build my computers. Once again thank you. I just wanted to say a huge thank you to you for your amazing hospitality during the training time. You made my job so much easier than it could have been and not only me but all the staff have commented on how relaxed and comfortable you made them feel. Your venue is heads and shoulders above the others in the area, and the difference is you. I can not express how much I enjoyed my time training at Computer Smart, so thank you, thank you, thank you!!! I will definitely be back! I would like to thank you all, I had a great time at Computer Smart. I found everyone only to willing to help at every moment. I thoroughly enjoyed the courses and would not hesitate to pass the good word on a about Computer Smart, which I have done already on a few occasions. I had an interview on Monday and I am sure one of the reasons I was chosen for the position was due to the fact I had done the MYOB course. Well thank you very much again. Small class numbers! Good location with some local shops, lovely tutor, lovely receptionist, Great Cake!! I’ve been procrastinating about doing this course for years, Sue helped bring me into the computer age, Finally!! I’m very grateful.